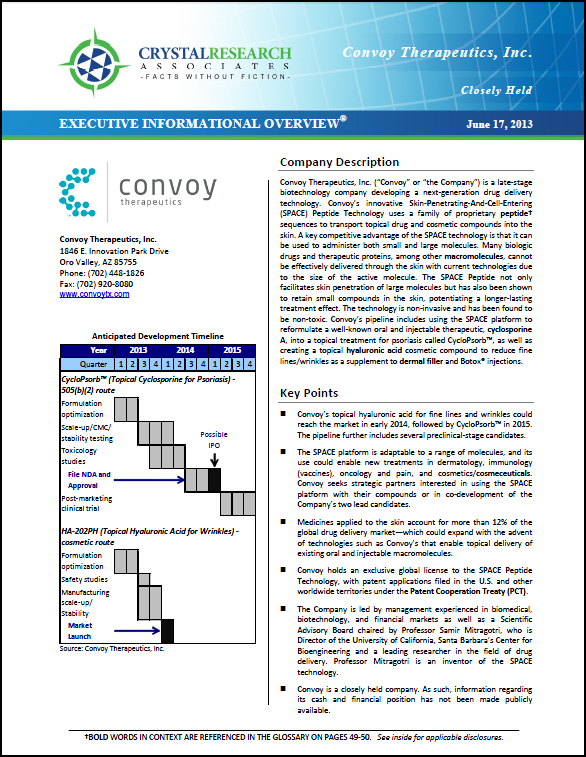 Convoy Therapeutics, Inc. ("Convoy" or "the Company") is a late-stage biotechnology company developing a next-generation drug delivery technology. Convoy’s innovative Skin-Penetrating-And-Cell-Entering (SPACE) Peptide Technology uses a family of proprietary peptide sequences to transport topical drug and cosmetic compounds into the skin. A key competitive advantage of the SPACE technology is that it can be used to administer both small and large molecules. Many biologic drugs and therapeutic proteins, among other macromolecules, cannot be effectively delivered through the skin with current technologies due to the size of the active molecule. The SPACE Peptide not only facilitates skin penetration of large molecules but has also been shown to retain small compounds in the skin, potentiating a longer-lasting treatment effect. The technology is non-invasive and has been found to be non-toxic. Convoy's pipeline includes using the SPACE platform to reformulate a well-known oral and injectable therapeutic, cyclosporine A, into a topical treatment for psoriasis called CycloPsorb™, as well as creating a topical hyaluronic acid cosmetic compound to reduce fine lines/wrinkles as a supplement to dermal filler and Botox® injections. * The Corporate Snapshot was last updated on June 17, 2013.